The first of our three social justice forums took place on Tuesday the 16th of October at St Johns in the City. Laura, Sheldon and Ellie from Peace Action Wellington talked about the involvement of New Zealand companies in the arms trade and showed video material of protests against weapons dealers both here and abroad. The plans of the newly formed Peace Action Manawatu to protest the upcoming weapons expo in Palmerston North on the 31st of October were also discussed. Special guest speaker, Golriz Ghahraman MP, gave a passionate speech on the need to stop arms dealers from plying their trade in Aotearoa. She drew attention to the death and destruction caused by weapons on innocent civilian populations and their role in the continuing refugee crisis. The forum ended with a series of small group activities to discuss and demonstrate non-violent direct action techniques, how to practise them safely and the need for emotional first aid when confronted by violence. 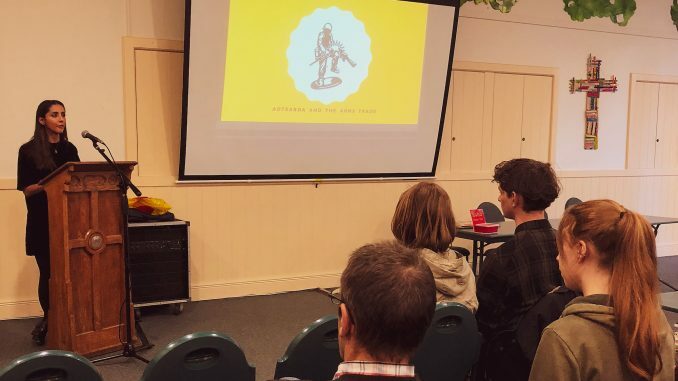 Many thanks to Peace Action Wellington, Golriz and to all of the people who took time out of their busy lives to make this event such a success. Our next social justice forum will be on Wednesday the 14th of November at 6.00 pm in St Johns in the City where People Against Prisons Aotearoa will be talking about prison abolition and transformative justice.